Mt. 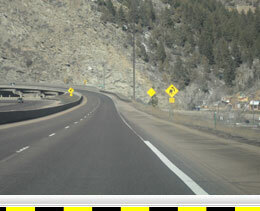 Vernon Canyon is a mountain pass in the Colorado Rockies located on Interstate 70 just east of the Continental Divide. Mt. Vernon Canyon is one of three steep grades on I-70 between Denver and Utah with the Eisenhower Pass and Vail Pass to its west. Mt. Vernon Canyon is made up of two grades with its west grade, commonly called Floyd Hill, and its east grade, commonly called Genesee Hill. The two grades are separated by 6 miles of rolling hills with mild descents between their summits. Westbound I-70 from the Summit of Floyd Hill has a vertical descent of 627 feet over a distance of 2.1 miles. This descent begins with a large overhead sign warning of the approaching 6% grade. This grade is steep but relatively short by Colorado standards. Near the base of Floyd Hill is a sharp curve on a narrow bridge that has a history truck of roll-overs making this so this is a dangerous descent. 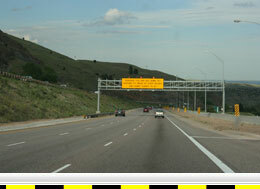 Eastbound I-70 from the Summit of Genesee Hill has a vertical descent of 1,589 feet over a distance of 6.5 miles. The reported grade for this descent is 6% and trucks over 30,000 pounds are restricted to 35 mph. 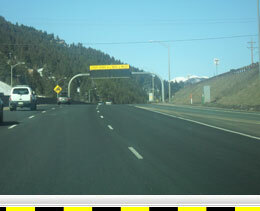 Genesee Hill is the entrance/exit to the Colorado Rockies and is the last grade descent for eastbound I-70. The Genesee Hill grade levels out near the Denver Metro area around the 260 milepost and has a continued lesser descent to about the 263 milepost. Summit Elevation: Floyd Hill Westbound: 7,916 ft.
Genesee Hill Eastbound: 7,732 ft.
Posted Speed Limit: 55 mph / 35 mph trucks over 30,000 lbs. *These speeds are based on an average grade from the summit to the base. Some grade segments may be steeper than the average and require a slower speed.